Taste test: These kettle chips were thinly cut so you could sort of see through them (sort of a bubble effect). 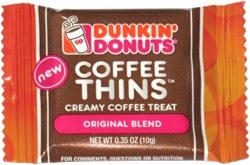 They were a little bit less salty than Cape Cod's excellent kettle chips, but they tasted just as good. 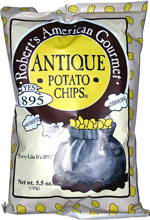 The funny part about these chips is that they're made by Robert's American Gourmet, so you'll find them alongside the Pirate's Booty and Veggie Booty and other "healthier" snacks, but there's nothing in them that would imply "healthy snack" (8g of fat and 150 calories per serving). Smell test: They smell a little stale, almost moth-bally.